Repair of congenital heart diseases has become a routine in infancy because of the physiological benefit of promoting normal growth and development, limiting the pathophysiological consequences of cardiac defects such as volume overload, pressure overload, and chronic hypoxemia. Advances in surgical techniques and postoperative management have altered the expectations for mechanical ventilation following cardiac surgery. The concept of “fast-track” postoperative care postcardiac surgery, predicated on early extubation, has been present for the last two decades.,, Although widely described in adult population and has shown to reduce the duration of Intensive Care Unit (ICU) stay and cost without altering mortality and morbidity, the concept is quite less well described in children.,,, The paucity of pediatric data, heterogeneity in the individual's age, physiology and anatomical complexities and nonavailability of consistent clinical practice guidelines have made it difficult to adapt the practice of fast-tracking. 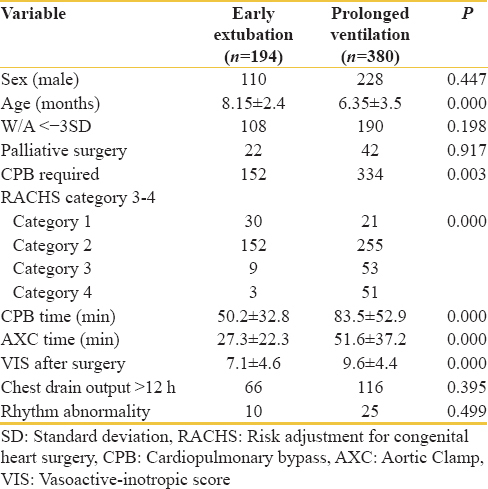 The primary objective of the current study was to evaluate the timing of first extubation in neonates and infants in our cohort and compare the outcomes of patient extubated early with those who required prolonged ventilation. We also evaluated the predictors of early extubation in our cohort. This prospective cohort study was conducted in 65-bedded pediatric cardiac ICU in India. After the institutional review board approval, all patients <1 year of age undergoing surgery for congenital heart disease with or without cardiopulmonary bypass (CPB) between June 2015 and November 2015 were enrolled. Patients shifted on extracorporeal membrane oxygenator (ECMO) support, those with open chest and critically sick in preoperative period were excluded from the study. Early extubation was defined as first extubation within 6 h of completion of surgery which was taken as the “sign out” time of WHO Surgical Safety Checklist. Mortality in ICU was considered as our primary outcome. Mortality in patient extubated early was taken as 2% and in those requiring prolonged ventilation as 8.5% based on the previous unpublished data from our center. To determine an absolute difference of 6.5% with 95% confidence interval and power of study as 80%, 2-sided sample size was calculated as approximately 185 in each group. Patients who were hemodynamic stable and had satisfactory transesophageal echocardiography findings were planned for extubation in operation theater (OT) or immediately on arrival in pediatric ICU (PICU). These patients received reversal (Naloxone 0.01 mg/kg intravenous and Neostigmine 0.03 mg/kg intravenous with Glycopyrrolate 0.02 mg/kg) in OT based on the opinion of anesthetist and surgeon. Patients shifted to PICU without receiving reversal were observed for hemodynamic stability and reversal was administered if required based on the opinion of intensivist and surgeon. Patients who remained hemodynamic unstable and/or had abnormal two-dimensional (2D) echocardiography (persistent severe PAH, left ventricular [LV] dysfunction, etc.) and/or hemodynamic significant arrhythmias were not planned for extubation, and no reversal was administered. In PICU hemodynamic monitoring was done on real-time monitors. Arterial blood gas was also monitored and 2D echocardiography was done within first 2 h to detect any significant abnormalities. Paracetamol (15 mg/kg body weight administered intravenous every 6 hourly) or NSAIDs (ketorolac 0.5 mg/kg body weight intravenous every 6 hourly as second-line agent) was used for analgesia if the patient was extubated or was planned for early weaning. Low-dose fentanyl (1–2 mg/kg/h) was used if the patient was planned for prolonged extubation or had any contraindication for extubation. Patients who were hemodynamically stable, had normal echocardiography, and in whom no significant rhythm abnormality was noted were not given any sedation and were planned for extubation. Short-acting sedatives (Midazolam intravenous bolus 0.1–0.2 mg/kg) if required were used. Patients not planned for immediate extubation due to any reasons were given intravenous Midazolam infusion (1–2 μg/kg/min) for sedation. Patients were considered fit for extubation when adequately awake, normothermic (core body temperature 36°C), regularly self-breathing with tidal volume of at least 5 mL/kg, normal preextubation arterial blood gas analysis on FiO2 of 0.4, optimal hemoglobin with no metabolic acidosis, stable hemodynamics with minimal inotropic support, minimal chest tube drainage, and normal perioperative/postrepair transesophageal or epicardial echocardiography. Time of extubation from completion of surgery was noted. Those who could not be extubated early were evaluated for the likely causes associated with prolongation of ventilation. Procedures were classified according to risk adjustment for congenital heart surgery (RACHS) category. Vasoactive-inotropic score (VIS) was calculated using formulae: Dopamine dose (μg/kg/min) + Dobutamine dose (μg/kg/min) + 100 × Epinephrine dose (μg/kg/min) + 10 × Milrinone dose (μg/kg/min) + 10,000 × Vasopressin dose (units/kg/min) + 100 × Norepinephrine dose (μg/kg/min). Patients were dichotomized into groups who were extubated early and those who required prolonged ventilation for comparison of outcome. Outcome indicators used were ICU mortality, PICU length of stay, reintubation, and postoperative sepsis. Variables (preoperative, perioperative, and postoperative) were compared between the groups to analyze the risk factor for prolonged ventilation. Mann–Whitney U-test was used for analysis of continuous data and Chi-square test and Fisher's exact test for categorical data. P <0.05 was considered statistically significant. Variables which achieve statistical significance in univariate analysis were included in multivariate logistic regression analysis to identify independent risk factors, and odds ratio (OR) were calculated. Of the 598 patients screened, 1 patient was shifted on ECMO and 15 with open chest. In addition to this, 8 children were critically ill and required intubation in the preoperative period. These 24 children were excluded from the study. Five-hundred and seventy-four patients were enrolled which included 338 (58.9%) males and 236 (41.1%) females. Ventricular septal defect closure was the most common procedure performed (n = 140; 24.4%) followed by tetralogy of Fallot repair (n = 92; 16%). Baseline characteristic of the patients is shown in [Table 1]. One-hundred and ninety-four (33.8%) patients were extubated early including 2 extubation in operating room; 406 (70.7%) were extubated within 24 h and 4 (0.7%) died before extubation. The timing of extubation of patients in the cohort is listed in [Table 2]. Neonatal age group was the most vulnerable for prolonged ventilation with only 13.7% patient extubated early compared to 30.1% of children aged 1–6 months and 57.5% of children aged 6–12 months. Patients undergoing procedure listed in higher RACHS category were more vulnerable for prolonged ventilation. Only 5.6% (n = 3) of children undergoing RACHS category 4 procedures underwent early extubation compared to 58.8% of patients undergoing RACHS category 1 procedure. Early extubation rates in patients with RACHS category are depicted in [Table 3]. Overall mortality [Table 4] in the study was 3.5% (n = 20) which was lower in patient extubated early although statistical significance was not reached. Twelve (60%) patients died of cardiac complication commonest being right ventricular failure secondary to refractory pulmonary arterial hypertension (n = 5). Other common causes were LV failure (n = 3), refractory ventricular arrhythmias (n = 1), suspected blocked Blalock–Taussig shunt (n = 1), and unexplained cardiac arrest (n = 2). The most common noncardiac cause of death was ARDS secondary to ventilator-associated pneumonia (VAP) (n = 6) and septic shock (n = 2). Thirty-nine (6.8%) patients required reintubation with no significant difference between the groups. Majority of the reintubation were due to cardiac reasons with the most common being pulmonary artery hypertension (n = 14), left heart failure (n = 10), cardiac arrhythmias (n = 3), and unexplained cardiac arrest (n = 2). Noncardiac indications for reintubation were VAP (n = 7), diaphragmatic palsy (n = 2), and septic shock (n = 1). Twenty-four (4.2%) patients developed sepsis in the postoperative period during the ICU stay. None of the patient extubated in OT developed sepsis, whereas 3 (1.6%) patients extubated within 6 h developed sepsis. The incidence of sepsis in patients extubated between 7 and 24 h was 2.3% (n = 5), 25–48 h was 6.7% (n = 6), >48 h was 10.8% (n = 8), and those who could not be extubated was 50% (n = 2). The incidence of sepsis was significantly lower in patients who were extubated early (1.8% vs. 5.5%; P = 0.024). Mean duration of ICU stay was 94.2 ± 64.6 h which was significantly higher in patients who required prolonged ventilation (111.6 ± 70.8 h vs. 60.2 ± 28.1 h; P = 0.000). In the univariate analysis [Table 3], younger age, higher RACHS category, surgery requiring CPB, higher CBP and aortic clamp (AXC) time, and higher inotropic support requirement depicted by high VIS score were more common in group which requires prolonged ventilation. In multivariate logistic regression analysis [Table 5], age <6 months (P = 0.000; OR – 4.61), RACHS category ≥3 (P = 0.000; OR – 9.78), CPB time ≥80 min (P = 0.004; OR – 9.69), AXC time ≥60 min (P = 0.000; OR – 11.61), and VIS score ≥10 (P = 0.000; OR – 3.05) were independently associated with prolonged ventilation. In the current study, 33.8% patients were extubated early. Reported rate of early extubation in previous studies is 27%–82%.,,,,,,,,,, The variation could be attributed to inconsistency in the definition of early extubation. While many considered early extubation as extubation in operating room or just after arrival in ICU,,,,,, others have used cutoff of 3, 6, and even 24 h to define early extubation.,, Considering 24 h as cutoff for early extubation, the current rate would rise to 70.7% (n = 406) which is quite satisfactory considering the age group included. Majority of the earlier studies have excluded neonates and sometimes infants.,,, Even in studies which included neonates and infants, their number were in minority.,, The current study included children <1 year which could be a major factor for fewer number of early extubation in our cohort. Another important factor is the heterogeneity of the cases included. Many earlier studies have included homogeneous cohort of patients with simple congenital cardiac defects who were admitted electively., In the current study, we included infants and neonates who underwent variety of procedures with complexity ranging from RACHS category 1–4 although no cases of RACHS category 5 were performed during the study period. In the current study, lowest early extubation rate was among the neonates with rates increasing with age group. The mean age of children extubated early was also significantly higher than others. Age <6 months was found to be independent risk factor for prolonged ventilation (OR – 4.61; P = 0.000). Neonatal age has been found unfit for early extubation largely due to the low pulmonary compliance and persistent pulmonary hypertension. Majority of the earlier researchers have even excluded neonates and early infants in their study of early extubation postcardiac surgery.,,,,, Recently, many reports of early extubation in neonates are available. Heinle et al. reported successful early extubation of 45% of infants <90 days old. A previous study from our institution reported an overall early extubation as high as 87.1% in the cohort compromising children which included 40% neonates. Complexity of the procedure has been shown to affect the outcome after pediatric cardiac surgery.,, Ödek et al. found RACHS-1 category procedure to be associated with early extubation. Mittnacht et al. in their article recommended the patients listed in risk category 1–3 to be eligible for fast-tracking whereas in those classified as RACHS 4 and 5, the decision rests on the evaluation of the practitioner. RACHS 6 patients were typically not considered eligible for fast-tracking. In the current study, we also found higher early extubation rates in procedure classified in lower RACHS category. 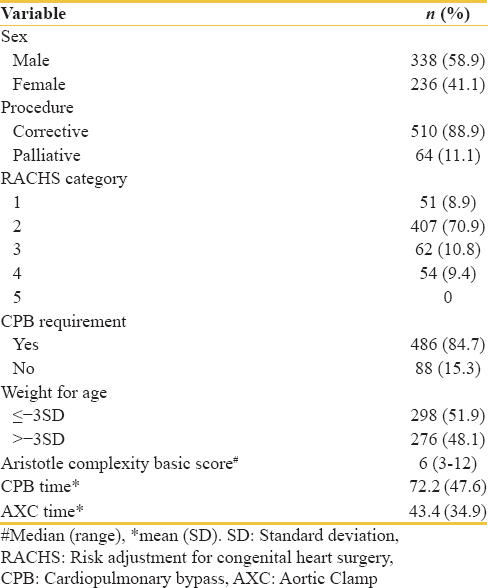 RACHS category ≥3 was an independent risk factor for prolonged ventilation. Longer CPB and AXC time which depict long procedure time has been associated with delayed extubation in previous studies.,,,,, The effects of prolonged CPB relate in part to the interactions of blood components with the extracorporeal circuit and result in a systemic inflammatory response syndrome which in turn increases interstitial fluid resulting in increased risk of multiorgan dysfunction. In the current study, CPB time ≥80 min and AXC time ≥60 min were significantly associated with prolonged ventilation. We also found higher inotropic requirement (depicted by higher VIS) to be significantly associated with delayed extubation; which is supported by earlier studies.,, Gaies et al. found high VIS to be associated with prolonged time of first extubation postpediatric cardiac surgery. Overall mortality and reintubation rate was found to be lower in the group extubated early although the difference could not reach statistical significance. Harris et al. found early extubation to be associated with lower mortality and reintubation whereas Preisman et al. found no significant difference., The mean duration of ICU stay has been found to be significantly higher in the group with prolonged ventilation in earlier studies and is supported by the current study.,,,,, Heinle et al. found that neonates and young infants who underwent early extubation after cardiac surgery had hospital stays 3 days less than those ventilated for longer periods and average cost lower by approximately $10,000. The incidence of sepsis was significantly lower in patient extubated early. The probable reason could be fewer incidences of ventilator-associated infections and less requirement of invasive lines in these patients. Fewer postoperative respiratory complications have been reported to be an important benefit of early extubation by Kurihara et al. The limitation of the study was the absence of fixed anesthesia protocol, and the type and dosage of anesthetic drugs used were not studied which could be an important determinants in fact tracking of any surgery. Furthermore, the use of modified ultrafiltration during CPB has been found to reduce the physiological complications related to CPB and can make fast-tracking easy, but this effect was not studied in the current study. Although patients in the PICU were managed according to the protocol, chances of variation could not be ruled out. Being a single-center study, the data could not be extrapolated to large section of the population. We suggest formulation of uniform guidelines nationwide to manage postoperative pediatric cardiac surgery patients which could be possible only by nationwide registry of the cases and more multicentric protocol-based studies. Early extubation in infants lowers the PICU stay and sepsis without increasing mortality and reintubation. However, number of infants especially neonates undergoing early extubation is low. Age more than 6 months, less complex of procedure, shorter surgery time, and lower inotropic requirement are independent predictors of early extubation. Barash PG, Lescovich F, Katz JD, Talner NS, Stansel HC Jr. Early extubation following pediatric cardiothoracic operation: A viable alternative. Ann Thorac Surg 1980;29:228-33. Heard GG, Lamberti JJ Jr., Park SM, Waldman JD, Waldman J. Early extubation after surgical repair of congenital heart disease. Crit Care Med 1985;13:830-2. Schuller JL, Bovill JG, Nijveld A, Patrick MR, Marcelletti C. Early extubation of the trachea after open heart surgery for congenital heart disease. A review of 3 years' experience. Br J Anaesth 1984;56:1101-8. Hawkes CA, Dhileepan S, Foxcroft D. Early extubation for adult cardiac surgical patients. Cochrane Database Syst Rev 2003;4:CD003587. Higgins TL. Safety issues regarding early extubation after coronary artery bypass surgery. J Cardiothorac Vasc Anesth 1995;9:24-9. Joachimsson PO, Nyström SO, Tydén H. Early extubation after coronary artery surgery in efficiently rewarmed patients: A postoperative comparison of opioid anesthesia versus inhalational anesthesia and thoracic epidural analgesia. J Cardiothorac Anesth 1989;3:444-54. Keresztes PA, Kuruzar L. Very early extubation: Extubating in the OR following coronary artery bypass. Dimens Crit Care Nurs 1996;15:198-204. Simsic JM, Cuadrado A, Kirshbom PM, Kanter KR. Risk adjustment for congenital heart surgery (RACHS): Is it useful in a single-center series of newborns as a predictor of outcome in a high-risk population? Congenit Heart Dis 2006;1:148-51. Gaies MG, Jeffries HE, Niebler RA, Pasquali SK, Donohue JE, Yu S, et al. Vasoactive-inotropic score is associated with outcome after infant cardiac surgery: An analysis from the Pediatric Cardiac Critical Care Consortium and Virtual PICU System Registries. Pediatr Crit Care Med 2014;15:529-37. Preisman S, Lembersky H, Yusim Y, Raviv-Zilka L, Perel A, Keidan I, et al. A randomized trial of outcomes of anesthetic management directed to very early extubation after cardiac surgery in children. J Cardiothorac Vasc Anesth 2009;23:348-57. Laussen PC, Reid RW, Stene RA, Pare DS, Hickey PR, Jonas RA, et al. Tracheal extubation of children in the operating room after atrial septal defect repair as part of a clinical practice guideline. Anesth Analg 1996;82:988-93. Burrows FA, Taylor RH, Hillier SC. Early extubation of the trachea after repair of secundum-type atrial septal defects in children. Can J Anaesth 1992;39:1041-4. Kloth RL, Baum VC. Very early extubation in children after cardiac surgery. Crit Care Med 2002;30:787-91. Heinle JS, Diaz LK, Fox LS. Early extubation after cardiac operations in neonates and young infants. J Thorac Cardiovasc Surg 1997;114:413-8. Neirotti RA, Jones D, Hackbarth R, Paxson Fosse G. Early extubation in congenital heart surgery. Heart Lung Circ 2002;11:157-61. Manrique AM, Feingold B, Di Filippo S, Orr R, Kuch BA, Munoz R, et al. Extubation after cardiothoracic surgery in neonates, children, and young adults: One year of institutional experience. Pediatr Crit Care Med 2007;8:552-5. Meissner U, Scharf J, Dötsch J, Schroth M. Very early extubation after open-heart surgery in children does not influence cardiac function. Pediatr Cardiol 2008;29:317-20. Mittnacht AJ, Hollinger I. Fast-tracking in pediatric cardiac surgery – The current standing. Ann Card Anaesth 2010;13:92-101. Vricella LA, Dearani JA, Gundry SR, Razzouk AJ, Brauer SD, Bailey LL, et al. Ultra fast track in elective congenital cardiac surgery. Ann Thorac Surg 2000;69:865-71. Zureikat YJ, Al-Madani A, Makahleh Z. Early extubation in pediatric patients after cardiothoracic surgery. Heart Views 2007;8:40-42. Akhtar MI, Hamid M, Minai F, Wali AR, Anwar-Ul-Haq, Aman-Ullah M, et al. Safety profile of fast-track extubation in pediatric congenital heart disease surgery patients in a tertiary care hospital of a developing country: An observational prospective study. J Anaesthesiol Clin Pharmacol 2014;30:355-9. Garg R, Rao S, John C, Reddy C, Hegde R, Murthy K, et al. Extubation in the operating room after cardiac surgery in children: A prospective observational study with multidisciplinary coordinated approach. J Cardiothorac Vasc Anesth 2014;28:479-87. Ödek Ç, Kendirli T, Uçar T, Yaman A, Tutar E, Eyileten Z, et al. Predictors of early extubation after pediatric cardiac surgery: A Single-center prospective observational study. Pediatr Cardiol 2016;37:1241-9. Davis S, Worley S, Mee RB, Harrison AM. Factors associated with early extubation after cardiac surgery in young children. Pediatr Crit Care Med 2004;5:63-8. Harris KC, Holowachuk S, Pitfield S, Sanatani S, Froese N, Potts JE, et al. Should early extubation be the goal for children after congenital cardiac surgery? J Thorac Cardiovasc Surg 2014;148:2642-7. Kanter RK, Bove EL, Tobin JR, Zimmerman JJ. Prolonged mechanical ventilation of infants after open heart surgery. Crit Care Med 1986;14:211-4. Székely A, Sápi E, Király L, Szatmári A, Dinya E. Intraoperative and postoperative risk factors for prolonged mechanical ventilation after pediatric cardiac surgery. Paediatr Anaesth 2006;16:1166-75. Vida VL, Leon-Wyss J, Rojas M, Mack R, Barnoya J, Castañeda AR, et al. Pulmonary artery hypertension: Is it really a contraindicating factor for early extubation in children after cardiac surgery? Ann Thorac Surg 2006;81:1460-5. Kurihara Y, Shime N, Miyazaki T, Hashimoto S, Tanaka Y. Clinical and hemodynamic factors associated with the outcome of early extubation attempts after right heart bypass surgery. Interact Cardiovasc Thorac Surg 2009;8:624-8. Reyes A, Vega G, Blancas R, Morató B, Moreno JL, Torrecilla C, et al. Early vs. conventional extubation after cardiac surgery with cardiopulmonary bypass. Chest 1997;112:193-201.